I guess most of us have dreamed of owning a nice house where we can have all the liberty to decorate and put all the stuff that our heart’s desire. Just how many times you find yourself stopping by the furniture store just to get a glimpse of your would-be favorite chair or those sparkling chandeliers hanging in the store waiting for you to purchase it. You might have promised yourself that since it is recession year, you will not allow yourself to swipe your little 'plastic money' at the counter but how can you resist taking home a nice accent sofa or a nice lamp? I reckon it would not hurt your pocket if you really made a good purchase. 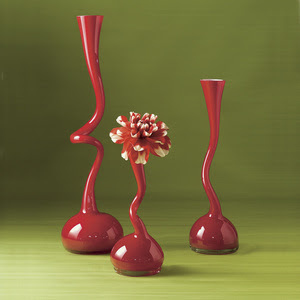 Just take for example these Gump’s hand blown vases that my eyes feasted on. The shape is so striking that it’ll start up a conversation among your friends when they see them at your home. Actually we can affordably decorate our homes with nice furniture pieces and that is if we know where to find one. I can recommend you to browse StyleHive.com and there’s no doubt you’ll find good ideas and inspirations for your homes. Unearthing the stylish in you is worth the try because in no time you’ll be decorating your house in a tasteful manner.